The Nigerian Civil Society has accused the police of massive redeployment of officers outside the state. The Nigerian Civil Society has accused the police of interfering in election process in Anambra state. The Anambra state governorship election holds on Saturday, November 18 across the state. The society also accused the police of massive redeployment of officers outside the state and bringing in new officers who have no knowledge of the terrain or possible flash points in the state. The police was also accused of secretly invading INEC’s head office in Awka on Monday. Officers claimed there was a bomb scare within INEC’s premises and they stayed there for over three hours. No one was allowed in or out, and people were warned to stay away from the entire premises. 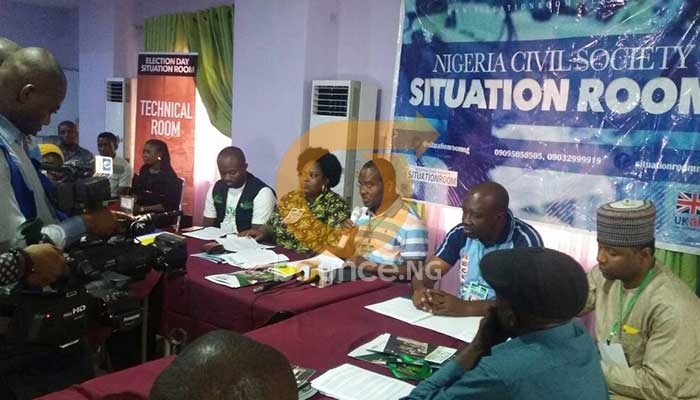 Speaking during a situation room briefing on Thursday, Clement Nwankwo, Executive Director, Policy and Legal Advocacy Centre (PLAC) cautioned the police and other security agencies to carry out their duties with caution and respect for the rule of law. Bounce News had reported a deployment of 26,000 police officers for the election following reported threats by the Indigenous People of Biafra (IPOB).